Maryland has the ninth highest percentage of roads in poor condition, and Virginia ranks in the top five when it comes to spending to build and maintain state highways. Those are some of the local take-aways from an analysis comparing infrastructure conditions and spending across the country. WASHINGTON — Maryland has the ninth highest percentage of roads in poor condition, and Virginia ranks in the top five when it comes to spending to build and maintain state highways. Those are some of the local take-aways from an analysis comparing infrastructure conditions and spending across the country compiled by the website 24/7 Wall Street. About 16.8 percent of the roads in Maryland were classified in poor condition — well above the national average of around 11 percent. Fewer than 9 percent of roads in Virginia were ranked in poor condition. Both states ranked in the middle of the pack when it came to structurally deficient bridges. About 5.8 percent of bridges in Maryland and about 6.7 percent of bridges in Virginia were classified as deficient. Structurally deficient means that inspectors have rated at least one element of a bridge as needing repair. Nationwide, about 9 percent of bridges are classified as deficient. The analysis found more dams at high hazard risk in Maryland than Virginia — 22.8 percent to 16 percent. High hazard risk denotes dams that, if they failed, would likely result in deaths. Across the country, about 17 percent of dams are categorized as high hazard. Virginia ranks in the top five states when it comes to highway spending, and Maryland spends more than the national average, according to the analysis. Data on roads and bridges came from the Federal Highway Administration. Information on dams was compiled from the U.S. Army Corps of Engineers and the Assocation of State Dam Officials. The rankings did not include figures for D.C.
An analysis released by the American Road and Transportation Builders Association earlier this year, and based on federal data, found that eight bridges in the D.C. area — including three owned and maintained by the federal government — were marked structurally deficient. 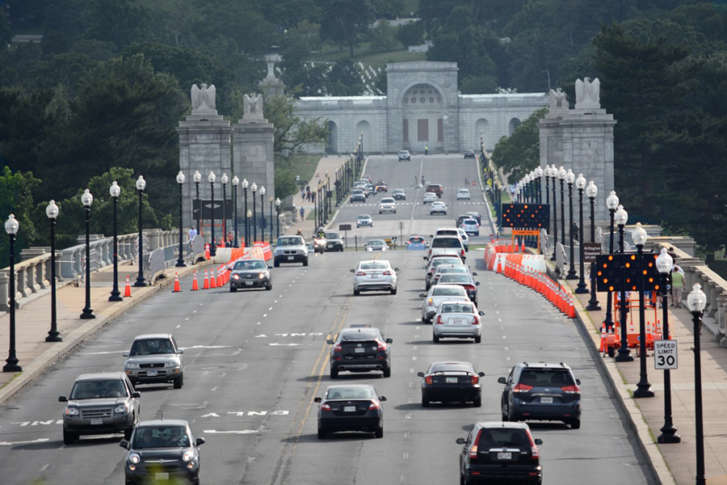 One of those federally owned bridges, Arlington Memorial Bridge, is in the early stages of a planned $250 million restoration project — one of the largest projects in National Park Service history. Overall, the total estimated costs of repairing the nation’s roads, bridges and dams is on pace to exceed $2.4 trillion, according to 24/7 Wall St.